A contemporary take on a classic mid-century style, our Earnshaw large corner sofa, designed by award winning furniture designer Tim Fenby, is one smart corner sofa. Its effortlessly cool slim frame and wide bench cushion mean this subtly retro design works in all settings. Earnshaw’s petite proportions are tailored to maximise your living space. Crafted with comfort in mind, its super soft feather-wrapped seat cushions are ideal for nestling and provide abundant room for stretched-out snoozing. The tapered wooden legs are elegant and sturdy, and the chic curved arms add a touch of style. 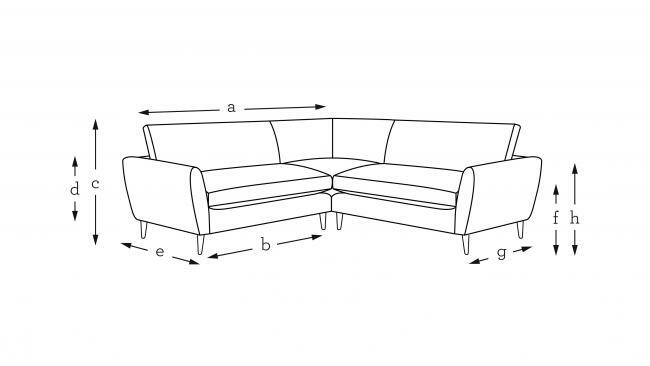 The Earnshaw large corner sofa is an epic all-rounder.